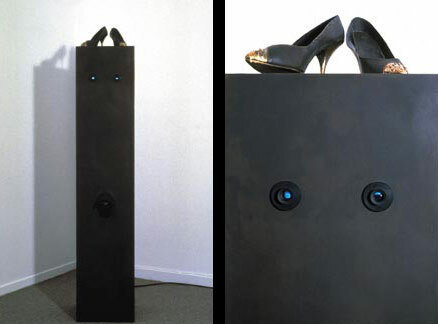 The bronze high heel taps as the viewer approaches. On the face of the pedestal are two peepholes, behind which are small video monitors. The monitor on the left displays the viewer’s own feet as they watch the video. The monitor on the right combines footage of the neon sign in the window of the Lusty Lady with images of Dorothy’ ruby red slippers and other various foot and shoe worship footage.